What do you understand by the word CANDIDATE PERSONA? It’s a term which has come from the popular marketing term ‘buyer persona’. Though the hiring process can be mapped with the sales process, it’s much more different than that. We can look at the sales process and buyer persona as an analogy to understand how we can implement certain sales principles in the hiring process for a better outcome, and CANDIDATE PERSONA is one of those principles. 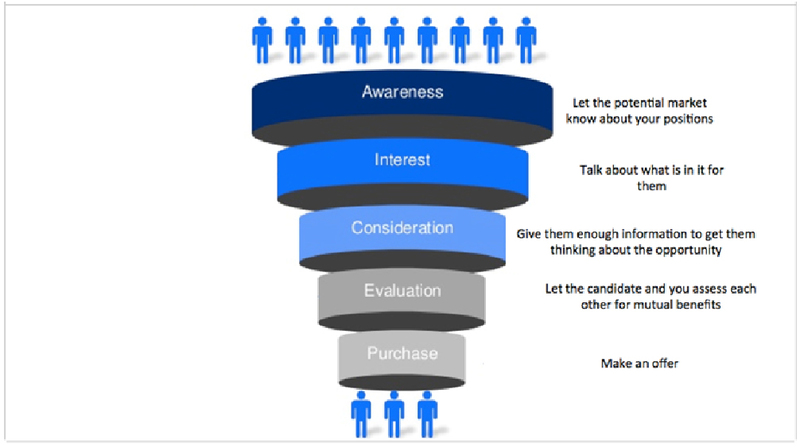 A typical marketing and sales cycle starts from creating awareness and ends with a purchase. Logically, when it comes to the hiring process, we do the same thing. We want to create awareness about what we have to offer to potential candidates, generate interest, let them see the opportunity lies in our offer, let us and them evaluate each other and finally make an offer as all looks good. If we look at this entire process, the key is the rate of conversion. When you have too many candidates in awareness phase and only a little get onboard, then your efforts go to waste. Which costs you a huge loss of time and money. Have you ever thought what could make the conversion rate high, so we get more with less? Attract the attention of right candidates at your offer. The more pass through the funnel, higher will be the conversion rate with lesser effort and a quick turn around. Now, let’s take a look the trick of getting the right candidates at the top. Candidate personas are fictional, generalized representations of your ideal candidates. They help you to understand your prospective candidates better, and make it easier for your hiring process to fill in specific positions that match with the role and responsibilities, and overall meet the expectations the business has from the candidates. Good candidate personas are based on your detailed analysis of the candidate profile, which you gather from your business through interviews and discussions. Depending on the range of positions and overall organization structure, you could have a separate candidate persona for each of those positions. Do you also need negative candidate personas? Whereas a candidate persona is a representation of an ideal candidate, a negative persona is a representation of who you don’t want as a candidate. When you know what you don’t want, it becomes easier to look for what you want. At the minimum, candidate personas allow you to target your recruitment for different open positions. For example, instead of sending the same company profile and relevant job description to everyone in your list of filtered candidates, you can segment by candidate persona and tailor your communication depending on what you know about those different personas. If you take the time to create negative candidate personas, you’ll have the added advantage of being able to segment out the “bad apples” from your sources, which can help you achieve a lower cost-per-position, and get the higher outcome from your recruitment efforts. How can you create CANDIDATE PERSONAS? Candidate personas are created through detailed analysis based on information collected through interviews of the business that led to the specific opening. That is not enough as you might want to consider your past experience in recruiting a specific position. If you already have some data about it, you might be able to create an effective and useful persona. Look through your database to uncover trends about how certain positions were filled and feedback from the business about their experience working with those candidates post recruitment. When creating questionnaire for the interview, ask questions that capture important persona information. For example, as all of your personas vary based on various positions the business has, ask information about team size, work culture, team profile, etc. You could also gather information on what forms of social media your existing team members use. Also, take into consideration existing team’s feedback on the recent recruit they are interacting and working with. Now that you know all about candidate personas, and how to use them while keeping negative candidate personas aside, we hope this will help you out to reach your perfect candidate. Check out our previous blogs too, in order to get some more information about hiring and recruiting. Stay tuned until we get back to you, soon!